Join us for A Winter Holiday celebration at the Old Church in downtown Portland and enjoy smiles with Santa Claus, GFCF cake and Carolers. Even more live entertainment provided by The Wilson High School Choir and The Rose City Trombones! Santa Claus, The Wilson High School Choir and The Rose City Trombones! 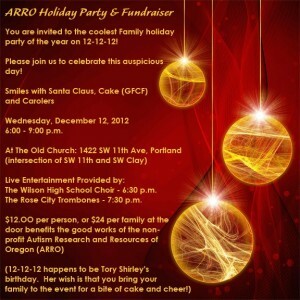 Join us for a holiday celebration and a fundraiser for the ARROAutism Family Holiday Assistance Project. This project will raise funds to buy a gift card for local families with Autism who are part of their County Developmental Disabilities Case Management program. We will be taking donations of GF/CF Food, new winter clothing, and toys for our local families with Autism who are in need. This entry was posted in Calendar, Fundraisers, News and Updates. Bookmark the permalink.